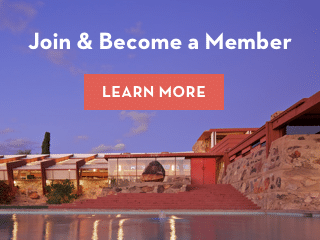 For nearly a decade, the Frank Lloyd Wright Foundation has invited a graphic designer to work full time on the Marketing and Communication team. The graphic design fellow is responsible for the visual identity of the Foundation, including designing the Frank Lloyd Wright Quarterly magazine. 2018-2019 graphic design fellow, Meagan Vanderhill, is sharing some of her favorite details she’s noticed at Taliesin West. I’ve lived at Taliesin West for the last four months. Being surrounded by such beauty is hard to wrap my head around and I remind myself daily to not take it for granted. Below, I have compiled a list of some of my favorite things at Taliesin West that bring me joy every day. These small details remind me to stop and appreciate the beauty around me. Oglivanna Lloyd Wright’s dog, Casanova, is memorialized in a statue that lives right outside the Communication office. I can see it from my desk and find myself looking at it throughout the day. Casanova is regal and stands watch over our office. He reminds me that Taliesin West has always been a space of community and fellowship. The people who came before me are still remembered and revered for the contributions they made to this place. Above the apartments of former Wright apprentices, is this beautiful railing I see on the way to my office. It has a unique geometric detail that is not seen anywhere else at Taliesin West. It is one of the first details that caught my eye when I came to Taliesin West, and I still find myself stopping to look at it. The dentils create this really interesting dotted shadow when the sun crosses the sky. Wright was inspired by the patterns and texture of the desert. He believed the desert was best articulated with a dotted line and used the dentils to create a texture that fit the desert context in which Taliesin West resides. The dentils’ shadows catch my eye more than a hard-edged shadow would and remind me to look up and see the sun at work in the sky. I walk through this door when I am going into the kitchen. The hinge isn’t on the edge of the door, so when the door is open a small part of it swings behind you. Though it can be problematic if someone is standing too close, I love it because I feel like the door is wrapping around me as I exit, nudging me out of the space in a really lovely and engaging way. I love these cutout details in the Garden Room. These three little cutouts in the desert masonry mimic the same angle that a lot of the walls were built at. It lets in light but also hints at the overall construction of the place and articulates the material of the building. Like the dentils, these cutouts help to remind us of the desert in which we live. This hand-painted sign hangs on a door next to the Cabaret’s exit. I love it because you can see the pencil marks where someone drew out the letters. It reminds me that Taliesin West was built by the hands of apprentices who lived here and loved this place. Taliesin West in the spring is truly a magical place. The desert comes alive with wildlife and wildflowers. These flowers are blooming in front of the Pavilion doors. The orange, delicate flowers contrast nicely with the bright red doors and change the way it feels to enter and exit the Pavilion. I love this quote in the Pavilion. It is a quote Wright found in The Book of Tea and a great reminder of what Wright believed in and how he built his spaces. It makes the fact that Taliesin West is still a residence and working space all the more sweet. The Foundation and The School of Architecture at Taliesin have worked together to keep this place functioning as a living space. The Citrus Grove is very special to Taliesin West. In the winter when the trees are producing fruit, employees and residents can go grab citrus whenever they want a snack. It was originally planted in early 1959, as one of Wright’s last projects at Taliesin West. The Citrus Grove, the Garden Squares, and the road that runs parallel to the Prow were all intended to draw the eyes away from the encroaching city and back to the nature Wright loved. In the desert behind Taliesin West are the desert shelters that the students dwell in. Trails connect shelters and tent sites to each other and back to the main building. As an effort to improve the site, Kamal Amin, a former apprentice, created beautiful trail markers to help people navigate their way through the desert. This graphic ornament always catches my eye when I am walking by. A lot of the details around Taliesin West are rust red or made of natural materials like desert masonry or exposed wood. The spires stand out because they are a striking blue, reminding me of the beautiful clear days we enjoy throughout spring. Wright installed this detail to remind us of the beautiful patterns throughout the desert. These stairs are right outside the Kiva, leading up to the Citrus Grove. The triangular cutouts are a delightful detail. At night they are used to light the stairs, but during the day they are a subtle detail that transforms the stairs into something beautiful. The Sun Deck is above the Kitchen and Dining Room. It beautifully frames the southwest view from Taliesin West. There is an amazing view of the Valley and Camelback Mountains. It is a great spot to enjoy the sunset or just sit and soak up some sun. The Moon Gate connects the courtyard outside of my office to Wright’s living quarters. It is a fun door that feels like a magical portal when you pass through it. It is just another detail that brings me joy every time I look at it. Every piece of Taliesin West has a story, and with each visit, there’s an opportunity to make a new discovery.